Camping on HWF is only allowed on Catlin Lake at 1) Birch Point lean-to and 2) designated tent sites at Sabattis Pass. Use of these locations requires permission of an AEC staff member who has been designated as the overseer of HWF camping activities. Housing fees will be applied to the use of these sites when appropriate. Users are responsible for providing their own firewood. No collecting or cutting of wood at the designated sites. Fires are to be of reasonable size (no bonfires) and contained within the established fire ring/fireplace. Don not re-build or "adjust" the fire ring. Outhouses are to be utilized during the stay. Food will be appropriately stored to avoid wildlife conflicts. 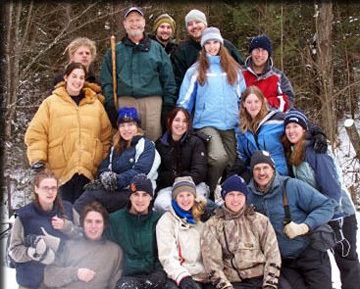 Educational groups camping on the property must have on-site supervision. Camping is restricted to designated tent sites only. Campfires are only allowed in the group fire ring located at Sabattis Pass cabin. The cabin is not for overnight camping but can be used as a shelter in hazardous weather. Group size is limited to 6 people. Campfires are only allowed in the fireplace.